The world is full of successful CEOs, innovative entrepreneurs, and risk-taking business owners, but every person follows their own path to the top. In our monthly interview column, How to Succeed, we pick the brains of industry leaders to find out how they got to where they are today. Hong Kongers are known to be avid travellers, and such a need calls for suitcases that are durable, functional and of course, fashionable at the same time. 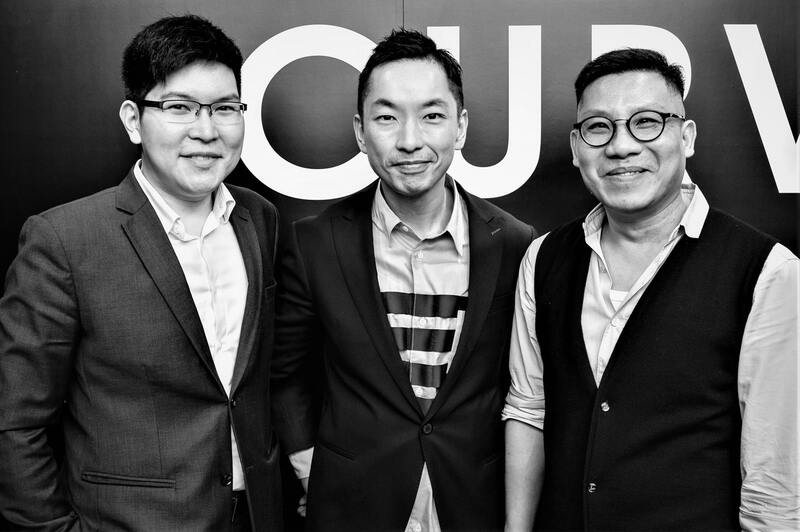 That’s where Anson Shum, co-founder of Hong Kong luxury luggage brand Ookonn, comes in. After graduating from fashion design at Central Saint Martins, Shum spent the next 12 years working his way up in the luxury fashion industry — from sales assistant to visual merchandiser and, eventually, scoring a top job in public relations. With his diverse background, it’s no exaggeration to say that Shum is an expert in the worlds of luxury and style. Shum’s discerning tastes is one of the many reasons that Ookonn, founded in 2016, attained global success in such a short period of time. 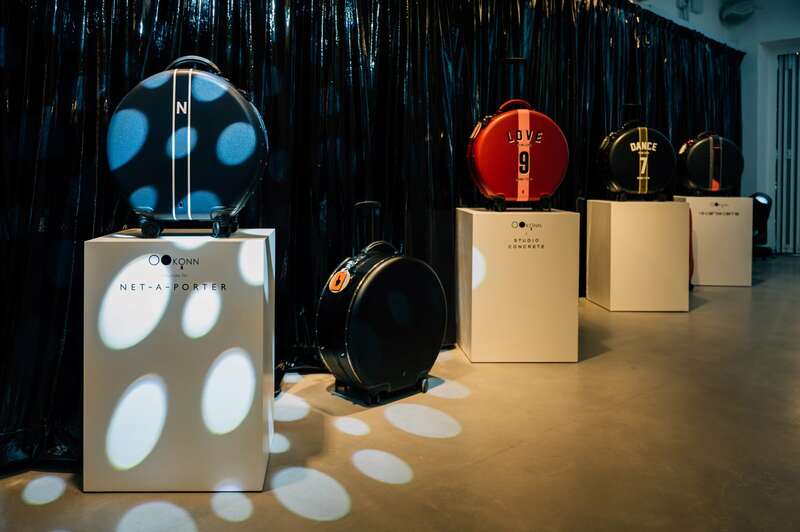 Defined by its youthful and unruly spirit, the instantly recognisable circular luggage continues to be featured in top magazine titles across the world from Vogue to Harper’s Bazaar, and is currently selling in 16 countries with retail partners including Net-a-Porter and Lane Crawford. 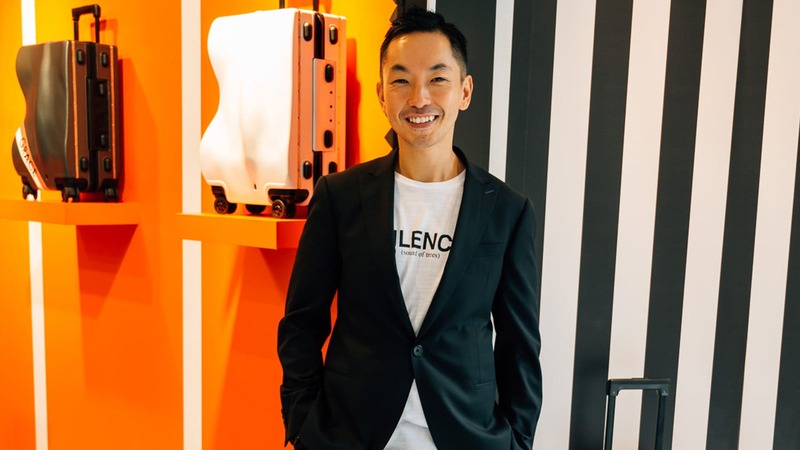 For this month’s How To Succeed, we sat down with Shum to learn more about his decision to quit his fabulous job to start Ookonn, his advice for building business relationships, and the inspiration behind his new collection that hits stores this June. Defined by its youthful and unruly spirit, Ookonn is currently selling in 16 countries with retail partners including Net-a-Porter, Lane Crawford and more. You had a great career in public relations but dropped it all to launch Ookonn. What made you feel it was time to just go for it? It’s never the right time when it comes to starting your own thing, you just have to rely on that gut feeling. This is especially true for design, because you are pursuing something that you create, which is not like you’re tapping into a particular market like real estate. You can jump into the real estate market and say ‘By this time next year, there’s a huge development happening in Hong Kong, therefore I’m going to work in real estate.’ It really doesn’t happen like that when it comes to design, so my answer is that it is never about finding the right time, but by finding that determination. When you start your own business, nothing is guaranteed. It’s literally the opposite of what you do in the corporate world. There is a sense of security that corporate can provide you with, getting a pay check at the end of every month. Starting a business is something entirely different, so if you don’t have the determination and be prepared for the worst you are doomed to fail. Know that you might not have the lifestyle you once had, but what is fantastic about it, is that you are guaranteed the opportunity of doing something that you can really enjoy, and it is that one single desire or determination for this experience that really drives you forward. What were some of your initial challenges? Far too many. First of all, I’ve never experienced fundraising. I was working in PR and communication, and as a marketer, all we knew or were trained to do was to spend, right? But fundraising is required when you need a budget to start a business. It’s a bit similar to getting your year-end budget, but it’s not quite the same because you are asking people to invest in a concept that is merely an imagination. Before you actually do your prototype, everything is on paper. Of course, getting an investor was only one of the many things that we had to deal with, another thing was to find a manufacturer willing to produce what they called ‘a weird shape’. At this point, 95% of the hard case polycarbonate luggage are done in China, and what the manufacturers always look for is quantity. So when you come in as a passionate designer or entrepreneur ordering in small amounts, they’re not interested unless you pay them a good margin, which is what a start-up cannot afford. We went to 20 different manufacturers and 19 of them turned us down; eventually we found one who was willing to develop (though back then they couldn’t guarantee that they could produce it with success), and they’ve been working with us ever since. How did you manage to get Bluebell Group to support you? Because I worked with them, and I guess I did a pretty good job? Ha, it’s more than that I think. Everything that we do is always about trust and teamwork, so when I decided to leave the company, I told them I’m not going to another company, but I’m thinking of starting my own thing. My boss back then was Ashley Micklewright, the CEO of Bluebell, and he asked me ‘Hey, what kind of idea do you have in mind? Don’t you know we are investors? We can support you. Of course we aren’t going to support you for the sake of doing it, it’s capital after all, but if the idea is right, maybe we’ll be able to support you a little in the beginning.’ I thought why not? I’ve got nothing to lose, right? Then after that, I spent six months (I was still working with them back then) working on a prototype. We didn’t want to spend money on the mould because it’s expensive, so we did 3D print. It’s not cheap, but still a lot cheaper than producing a metal mould, which can easily cost you HK$100k. It’s not that we didn’t believe in the product, it’s just that if you want to see the idea, there are plenty of resources nowadays which you can make use of to deliver. We did 3D print and I worked on a business proposal, which I had no idea about. I was talking about a five-year plan, and a lot of it, now looking back, was nonsense. Because when you are a startup, you don’t exactly know what’s going to happen. I mean, you don’t even know what’s going to happen tomorrow, how can you predict what’s going to happen in two years time? It was merely a starting point of storytelling; an imagination. So I was so surprised that a week after the meeting, they sent me an email and said ‘We’re going to invest in you.’ Too good to be true, right? But that was only day one. If I could foresee everything that I’ve been through together with my partners in the past two and a half years, I’d probably hesitate..! So you have two partners correct? Have you ever had any conflict? Yes, my partner Paul looks after production, and I also have Alan, the IT person, who manages the finance side of the business as well. I wouldn’t call our disagreements a conflict, but it’s more like a lesson. It happens even within families, so I don’t see it as a negative thing. I think it is important for each of us to have an idea or a goal in mind, and always remember that we are trying to do this to benefit the business and not for ourselves, otherwise it will overcomplicate things if we each have a different agenda behind every decision we make. We try to keep it as neutral as we can, but sometimes it’s difficult. For example, when we organise a product launch, there are always expected factors that will occur; but so far I think we are managing quite well. This is actually a very good question, because I do think people is one of the most important factors when you think about starting a business, because no one can do it alone. That's true, so what do you think is the key to success when it comes to working with other people in your team? I always treat them like they are part of the entity, making sure that they have a sense of ownership in whatever they work on. We try to adapt into their style as well, because a lot of them are very young and in their early 20s. It’s great because they’re telling me things that I don’t know about, I mean, especially if we are working on lifestyle and travel-related products, we need to be able to connect with the market. You can’t just do something that’s merely a personal idea. You managed to reach an international customer base very soon after your first launch, and were featured by top magazine titles from Vogue to Harper's Bazaar. How did you achieve that? Would it be okay if I say ‘luck’? We didn’t really expect to be able to reach certain platforms that early, but then, you know, one thing just led to another. I think the important thing about starting your own business is to not always think about the benefit you can have now, but to look at the bigger picture. Maybe what you are doing right now is not going to directly benefit you next month; but it’s okay, because it’s just like a ripple effect, and it will come back to you one day. I really do believe in cause and effect, that whatever energy you send out, positive or negative, will come back to you. So really try to do good things, don’t just look at immediate benefit, look at things in the long run. This is what we’ve been doing, and I guess that was what happened. 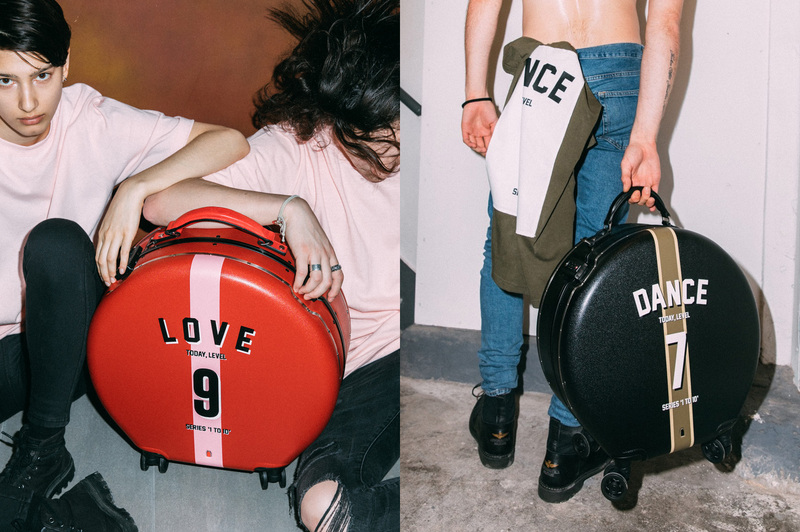 The latest Ookonn x Studio Concrete capsule collection, featuring Ookonn’s patented round rolling luggage with Studio Concrete’s signature Series ‘1 to 10’ conceptual prints. Your circular luggage is, of course, very distinctive -- can you tell us how you came across the idea? I don’t know if you’ll be satisfied with my answer: I just didn’t want another rectangular luggage, so the most straightforward option was round! I’ve always been obsessed with the round shape, because it’s not something that is manmade, and it actually appears in everything. The moon is round, for example, and the planet that we live in — I see a connection between us and the round shape. We also took reference from the hatbox, but the hatbox doesn’t have wheels, so what we did was add in all the features to make it more functional, and then we patented it. I was so surprised when I got the result saying that nobody else had registered this, so this really is a Hong Kong-based patented design. What about the new Curve collection? Tell us about it. The idea for the new collection came from sound. Sound can normally only be realised by your ears, but we wanted to visualise it as well; so my partners and I did some research and looked at the physics behind it, and we found that a lot of sounds made are curves, which is we call a sound wave. Sound is a fundamental element in our lives, it’s just that we usually take it for granted, and we wanted to emphasise its importance. 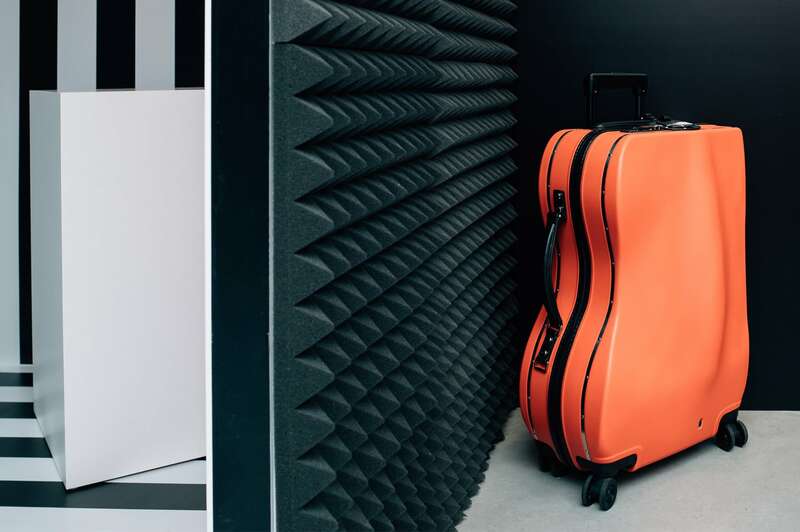 We wanted to capture that, so the new luggage design is actually a curve in a shape similar to a sound wave. There is also little curved bulges on the surface, which is inspired by a cello case. We have made it more functional, so now everyone including those who don’t play music can make use of this. Ookonn’s latest Curve collection is inspired by sound. Some say that you don't need the specific education to get to your dream career, what are your thoughts on that? Steve Jobs said, “You can’t connect the dots looking forward; you can only connect them looking backwards. So you have to trust that the dots will somehow connect in your future.” Education, as we all know, can help you to a certain point, but after that it’s another journey. So for me, my education at Central Saint Martins did help me get my first job, it taught me how to think as well, but it is not something you can comfortably live off of forever. I don’t believe in that. It should be an ongoing journey. So do you think Hong Kong provides a good environment for entrepreneurs? Any advice for aspiring business owners? I think it’s getting better and better. The unique thing about Hong Kong is that it is very international. You get people coming in from all over the world, so it’s a great platform when it comes to communication. Launching a product here, or whatever business you’re doing, may be a bit more expensive when rent is involved, but you actually get a lot of other benefits because we are essentially the bridge between China and the West. Even though China has been catching up quickly, I believe Hong Kong still has a very unique position because of all our experiences. So I would say be more open-minded, and don’t just look at Hong Kong as the only market to do your business. Also try to learn from other countries around Hong Kong, or even further down to Europe or America. I don’t mean to copy them, but to learn how they develop a business. Don’t forget we also have such a big support in our backyard, which is China. It is one of the greatest advantage that we have, and something that a lot of people from the west are dying for. For me, I’m proud to say that all my productions are done in China because it’s cost effective. I’m not selling luxury. For me, premium price point is my focus. I don’t want to target just a particular group of people. The more people can appreciate our design the better, because basically whoever travels will have a chance of finding them suitable. So yes, make use of the resources that we have and don’t try to be somebody else.